The mid-eighteenth century witnessed a particularly intense conflict between the Enlightenment philosophes and their enemies, when intellectual and political confrontation became inseparable from a battle for public opinion. Logan J. Connors underscores the essential role that theatre played in these disputes. This is a fascinating and detailed study of the dramatic arm of France’s war of ideas in which the author examines how playwrights sought to win public support by controlling every aspect of theatrical production – from advertisements, to performances, to criticism. An expanding theatre-going public was recognised as both a force of influence and a force worth influencing. By analysing the most indicative examples of France’s polemical theatre of the period, Les Philosophes by Charles Palissot (1760) and Voltaire’s Le Café ou L’Ecossaise (1760), Connors explores the emergence of spectators as active agents in French society, and shows how theatre achieved an unrivalled status as a cultural weapon on the eve of the French Revolution. 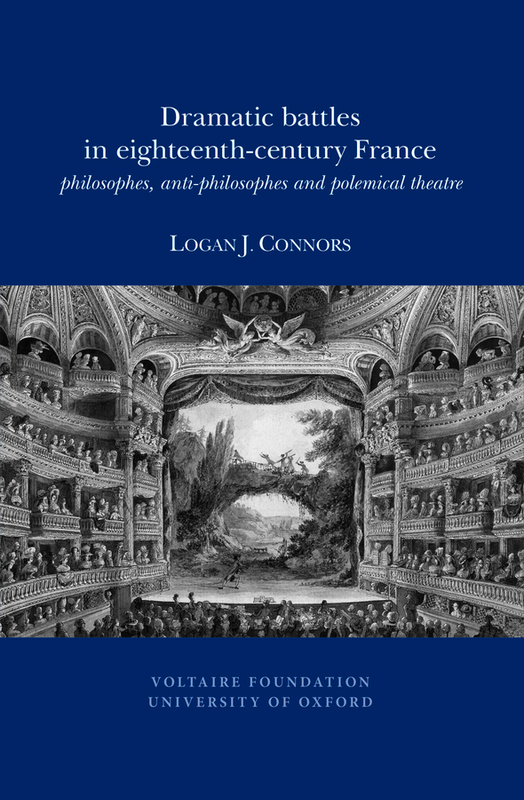 Adopting a holistic approach, Connors provides an original view of how theatre productions ‘worked’ under the ancien régime, and discusses how a specific polemical atmosphere in the eighteenth century gave rise to modern notions of reception and spectatorship. Eighteenth-century specialists are well acquainted with the controversies surrounding the premieres of Charles Palissot's Les Philosophes and Voltaire's Le Caffé; ou, L'Écossaise at the Comédie-Française in 1760. […] Connors offers new perspectives on the conflict by delving deeply into the pamphlet literature and periodical reviews of the affair. For example, there is an insightful analysis of the short pamphlet Les Philosophes manqués by André-Charles Cailleau, written in the form of a play but never intended for the stage, which demonstrates how participants in the controversy appealed to both readers and spectators. […] [T]his book is a welcome addition to recent interdisciplinary approaches to the interplay of public theatre and political culture in Old Regime and Revolutionary France. Connors’s rich description of the political and personal calculations involved in Voltaire’s decision to enter the fray convincingly buttresses the argument that these plays assume a new genre identity by being mobilized for publicity purposes that far exceed the boundaries of the stage. Logan J. Connors is Associate Professor of Modern Languages and Literatures at the University of Miami (FL). His next research project investigates the connections between the military and the performing arts in French colonies and provinces from 1650 to 1815.